I've been using oXygen XML Editor every day for a month and a half now, and every time I add a new topic to my ditamap, I am reminded of a small problem with the UI. When you add a subtopic, you select Append Child, but when you add a topic on the same level you should select Append Sibling. Instead, you have Insert After, which doesn't mean the same kind of thing (in the XML world, it is just too non-specific). Maybe I can see the problem easily because I am a native English speaker? It is subtle, but annoying. Thanks for the suggestion, I added an issue for this and I'll double check with one of my colleagues who is a native English speaker. So if you use the Insert After action on an existing topicref, it will insert a topicref right after the selected one. For me "Append" seems to suggest that something is added to the end (which in this case is not true, the topicref is added right after the current one) and also somehow that the added node will be a child of the selected node. I see what you mean, but look at it this way; when you use the terms "Append Child", you are using XML-speak (language from the XML domain). 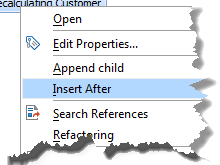 But when you say "Insert After", you are not using XML-speak. Instead, you are using general terms. You have lost meaning by speaking generally (i.e., using insert to mean add, and using after to mean adjacent to). Also, by not using the terms "Append Sibling", you've lost parallelism. Considering that Oxygen is a technical tool, and that is used for creating technical content, I think it would be fitting of you to update your UI accordingly. I'm no native speaker, but I'd suggest to keep Insert After for the reasons Radu explained. Remember where the action occurs and in that context, Insert After makes more sense. If you think of XPath axes, Append Sibling is too unspecific. You then have to say Append Following Sibling. But then, following-sibling means, 1:n nodes, so you should say Append a Following Sibling. But that's absurd. Here we are speaking about a DITA Map, which is transformed into something which is read top-down. And as an author, you should understand and read the map structure top-down. And therefore, I think, Insert After is an excellent label for this action. I agree that we have an inconsistency in our UI with regards to these two actions. However, I agree that "Insert After" should not be changed. It is very clear. Personally, I think the other one should be changed to "Insert as Last Child". This is as clear as it can be and it would make the two actions more consistent.